Nearly monodisperse cobalt ferrite (CoFe2O4) nanoparticles without any size-selection process have been prepared through an alluring method in an oleylamine/ethanol/water system. Well-defined nanospheres with an average size of 5.5 nm have been synthesized using metal chloride as the law materials and oleic amine as the capping agent, through a general liquid–solid-solution (LSS) process. Magnetic measurement indicates that the particles exhibit a very high coercivity at 10 K and perform superparamagnetism at room temperature which is further illuminated by ZFC/FC curves. These superparamagnetic cobalt ferrite nanomaterials are considered to have potential application in the fields of biomedicine. The synthesis method is possible to be a general approach for the preparation of other pure binary and ternary compounds. CoFe2O4, as a type of magnetic materials, has long been of intensive importance in the fundamental sciences and technological applications in various fields of electronics , photomagnetism , catalysis , ferrofluids , hyperthermia , cancer therapy , and molecular imaging agents in magnetic resonance imaging (MRI) . The applications of CoFe2O4 are strongly influenced by its magnetic properties. For biomedical applications, CoFe2O4 nanoparticles are required to have a narrow size distribution, high magnetization values, a uniform spherical shape, and superparamagnetic behavior at room temperature. So far, various synthetic routes have been explored for the preparation of CoFe2O4 nanoparticles, such as hydrothermal , coprecipitation [9, 10], microemulsion , forced hydrolysis , reduction–oxidation route . However, the main difficulty of these traditional methods is that the as-prepared nanoparticles are severely agglomerated with poor control of size and shape in most cases, which greatly restrict their applications . In order to solve the above problems, thermal decomposition of organometallic precursors in high-boiling organic solution has been explored [15, 16] for the preparation of size- and shape-controlled monodisperse CoFe2O4 nanoparticles [14, 17–19]. However, the major disadvantages of this method are the need of toxic and expensive reagents, high reaction temperature, and complex operations. To address these concerns, Li et al. adopted a general liquid–solid-solution (LSS) phase transfer and separation method . This strategy is based on a general phase transfer mechanism occurring at the interfaces of the liquid, solid, and solution phases present during the synthesis. Through this general method, Li et al. successfully synthesized Fe3O4 doped with Co, which has a coercivity about 250 Oe at room temperature . However, the synthesis of CoFe2O4 nanoparticles with a superparamagnetic behavior at room temperature has not been reported. In this letter, we report a significant improvement of the method of Li et al. to synthesize nearly monodispersed CoFe2O4 nanoparticles and systematically investigate the magnetic properties of the as-prepared nanomaterials. At room temperature, these as-prepared nanoparticles were found to have high saturation magnetization values of 50 emu/g and superparamagnetic behavior with negligible coercivity, which is expected to have potential application in biomedicine. The process for synthesizing nearly monodisperse CoFe2O4 with superparamagnetic behavior at room temperature was carried out as follows: In a typical synthesis, 1.6 g (6 mmol) of FeCl3·6H2O and 0.7 g of (3 mmol) CoCl2·6H2O were dissolved in the solvent composed of 80 ml of water and 40 ml of ethanol. After that, 7.3 g (24 mmol) of sodium oleate and 7 ml of oleic amine were added into the above solution with strongly stirring at room temperature for 2 h. Then, the reaction precursor was transferred into a Teflon-lined stainless autoclave with a capacity of 150 ml. In order to crystallize the particles, the reaction temperature of the autoclave was increased and maintained at 180°C for 12 h. Then, the system was cooled down to room temperature naturally. The products were separated from the final reaction solution by the addition of hexane. The red supernatant liquor containing CoFe2O4 nanoparticles was separated by a separating funnel. The as-prepared cobalt ferrite could be deposited by adding ethanol and obtained by centrifugating at a high speed (10,000 rpm) without any size-selecting process. The as-prepared samples could be well redispersed in a hexane solvent and stored for several months without delamination. Properties of the as-synthesized samples were charactered through several techniques. The phase contents and crystal structures of the samples were analyzed by X-ray diffraction (XRD) with Cu Kα radiation on a Philips X’pert diffractometer. Elemental analysis for metal iron was measured by an IRIS ER/S inductively coupled plasma emission spectrometer (ICP-ES). High-resolution TEM (HRTEM) analysis was carried out on a JEM-2010 transmission electron microscope with an accelerating voltage of 200 kV. One droplet of hexane dispersion of CoFe2O4 nanoparticles was dropped on a carbon-coated copper grid and then dried naturally before recording the micrographs. 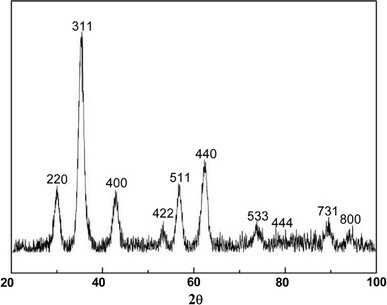 FTIR spectra of the samples capped with oleic amine were performed on a 170SX spectrometer in the range of 500–4,000 cm−1. Magnetic properties of the products were characterized at room temperature with a Lake Shore 7,304 vibrating sample magnetometer (VSM). Temperature and field dependences of the samples were recorded on a Quantum Design MPMS-XL superconducting quantum interference device (SQUID). ZFC/FC measurements were carried out in the temperature range of 10–330 K with an applied field of 100 Oe. The X-ray pattern of the as-synthesized samples is depicted in Fig. 1. The positions and relative intensities of all the peaks indicate that the crystalline structure of the products favors the formation of cubic spinel phase only, which is accordant to JCPDS card NO. 22-1086. No other impurity phases are observed. Additionally, it clearly shows that the as-synthesized CoFe2O4 samples reveal broadening diffraction peak, which is due to the reduced particle size. The average grain size of the as-synthesized nanoparticles calculated by Scherer’s formula  is 6 nm. Based of the highest intensity peak of (311), the calculated lattice parameter is 0.8456 nm, which is larger than the bulk CoFe2O4 value of 0.8391 nm. The enhancement of the calculated lattice parameter probably results from different distribution of metal cations compared with the bulk spinel cobalt ferrite and the surface distortion of particles induced by the size effect of nanoparticles . The chemical composition of the as-synthesized products is further analyzed by the inductively coupled plasma atomic emission spectroscopy (ICP-AES). The result reveals that the molar ratio of Co and Fe is 1:2.05, which is nearly consistent with the expected stoichiometry of CoFe2O4. Figure 2 shows TEM images of the CoFe2O4 nanoparticles obtained without any size-sorting process. It reveals that the as-synthesized nanoparticles were nearly monodisperse with spherical shape. The particle size with a narrow distribution is given in the inset of Fig. 2a. The average particles size is 5.5 nm, which is in good agreement with the particle sizes estimated by Scherer’s formula. This suggests that each individual particle is a single crystal . Figure 2b performs the high-resolution (HR) TEM characterizations of the particles, and the highly crystalline nature of the samples is revealed in the inset of Fig. 2b. 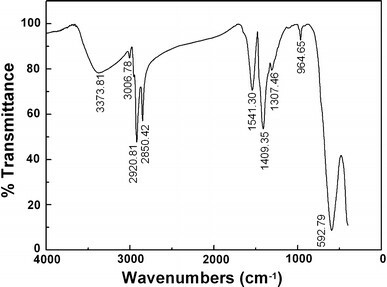 FTIR spectra of the samples capped with oleic amine were performed in the range of 500–4,000 cm−1(Fig. 3). The wide peak around 3,374 cm−1 is ascribed to the complexation between -NH2 and -OH on the surface of CoFe2O4. The peak at 3,007 cm−1 is assigned to the stretching of the vinyl group. The peaks at 2,921 and 2,850 cm−1 are attributed to the asymmetric and symmetric stretching of the CH2 groups, respectively. The sharp peaks are due to the long hydrocarbon chain of oleic amine. The peaks at 1,409 and 1,307 cm−1 correspond to C–H bending of CH2 group. The peak at 965 cm−1 is attributed to the O–H outplane vibration. The peak at 593 cm−1 is owing to the presence of ferrite nanoparticles. The FTIR spectrum confirms that the as-synthesized nanoparticles are coated by oleic amine, which can provide repulsive (electrostatic repulsion and steric repulsion) forces to balance the attractive forces (dipole–dipole interaction, exchange interaction, and van der Waals force.) between the nanoparticles. Thus, on account of the repulsion, the as-prepared CoFe2O4 samples are easily dispersed in the nonpolar solvents and stabilized in the suspension without agglomeration. The field dependence of the magnetization of as-synthesized particles measured at 300 and 10 K is shown in Fig. 4. Magnetic measurements indicate that the as-prepared particles exhibit superparamagnetic behavior with negligible coercivity (about 11 Oe) and remanence at room temperature. The saturation magnetization value is 50 emu/g at room temperature, which is less than the bulk value of 74 emu/g . For nanoscaled nanoparticles, the loss of the saturation magnetization is due to surface spin canting effect  and the presence of a magnetic dead or antiferromagnetic layer on the surface [13, 23], which is caused by finite-size effect of the small magnetic nanoparticles. Additionally, the magnetic performance of the ferrite-structured nanomaterials is also influenced by the distribution of metal cations, which is different from the bulk ferrite. A summary of the magnetic properties between the as-synthesized products and the reported CoFe2O4 is given in Table 1. 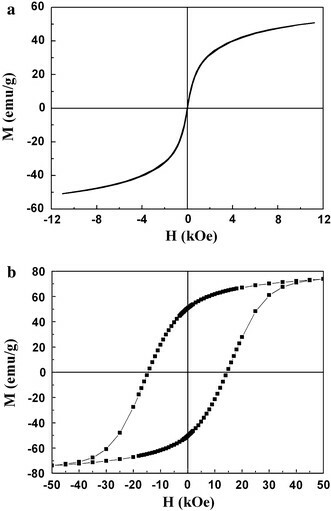 In our best knowledge, CoFe2O4 nanoparticles prepared in this work have a higher saturation magnetization value compared with the reported samples with superparamagnetic behaviors in the applied field of 12,000 Oe at room temperature. The saturation magnetization value (73.8 emu/g) measured at 10 K is close to the value of bulk CoFe2O4 (74 emu/g). 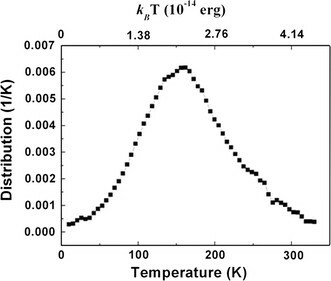 The particles exhibit superparamagnetic behavior with negligible coercivity (about 11 Oe) at room temperature, which is much lower compared with the value (250 Oe) reported by Li et al. . The magnetic properties of samples are greatly related to many factors, such as shape, size, and structure, which are influenced by the synthetic method and experimental parameters. This greatly reduced coercivity is understood as follows: The as-synthesized CoFe2O4 nanoparticles are spherical in shape, well-isolated, and the particle size of the product is found in the range of the critical size of CoFe2O4 for superparamagnetic limit reported in literature , which is about 4–9 nm. Additionally, the decrease of coercivity in our samples illuminates that the coercivity has a particle-size-dependent character . Whereas, the coercivity of the samples as-synthesized reaches 14.55 kOe, much larger than the value of bulk CoFe2O4 (about 5 kOe at 5 K). The comparisons of the magnetic properties measured at 300 and 10 K for our samples are summarized in Table 2.
where kB is the Boltzman constant, TB is the blocking temperature of the samples, and V is the volume of a single particle. The calculated magnetic anisotropy constant K of our samples is 3.8 × 106 ergs/cm3, which is slightly larger than that of the K values of bulk CoFe2O4 [(1.8–3.0) × 106 ergs/cm3]. 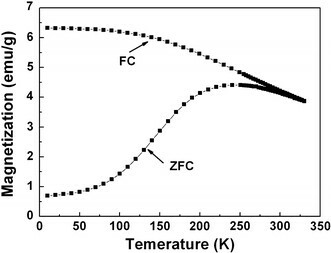 where MFC (FC magnetization) involves the total magnetization from the contribution of all particles, MZFC (ZFC magnetization) is determined by the magnetization from only the contribution of the nanoparticles whose energy barriers are overcomed by the thermal energy (kBT) at the measuring temperature, and f(T) reflects a quantitative characterization for superparamagnetism of the magnetic nanoparticles. Figure 6 reveals the calculated anisotropy energy distribution for the as-synthesized CoFe2O4 nanoparticles. Generally, the volume and shape distribution of the samples determine the magnetic anisotropy energy distribution. Therefore, the result implies that the thermal energies of most particles have exceeded the energy barriers beyond TB(about 240 K). So the as-synthesized samples display superparamagnetic behavior at room temperature. In addition, the narrow magnetic anisotropy energy distribution reveals that the as-prepared CoFe2O4 nanoparticles possess uniform sizes [13, 30]. The superparamagnetic behavior and narrow size distribution imply that the sample prepared in this work is a good candidate for the possible biomedical applications. In conclusion, nearly monodispersed CoFe2O4 nanoparticles were prepared under a simple hydrothermal condition. The as-synthesized samples are considered to have potential applications in biomedicine for its narrow particle size distribution, high saturation magnetizations, and superparamagnetization at room temperature. The simple synthesis route used in this work is expected to be a general approach for the preparation of binary and ternary metal oxide, especially spinel ferrite. An erratum to this article is available at http://dx.doi.org/10.1007/s11671-010-9777-9. This work is supported by China Postdoctoral Science Foundation Funded Project and the National Natural Science Foundation of China under Grant Nos. 50602020.